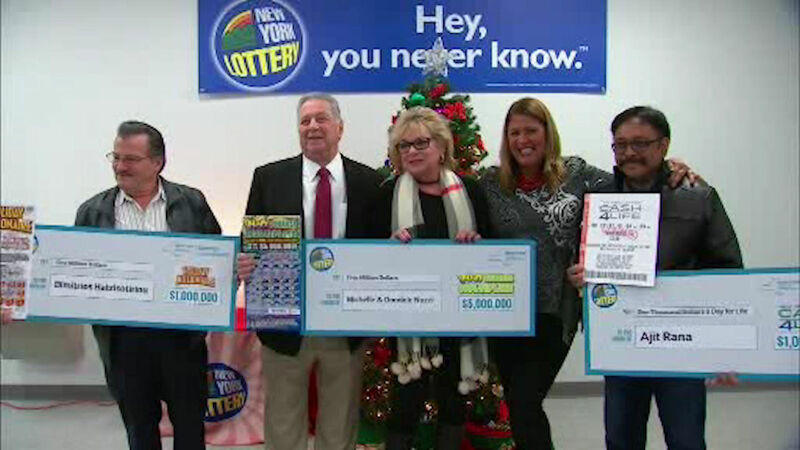 NEW YORK (WABC) -- There are four new millionaires thanks to the New York Lottery. More than $13 million was handed out to four big winners Thursday. One of them is a pizzeria owner from Long Island who won a million dollars on his 73rd birthday. The man from Lake Grove says he got to the bank too early so he went to a nearby store and bought scratch tickets. He won $25. So, he used some of the money to get a Holiday Millionaire ticket. He says he now plans to pay some bills and visit his mom in Greece. A couple from Glen Head, Long Island also won $5 million. The big winner was a store owner from Queens. He won $7 million.